This time of year, we’re all tired. Teachers are tired, and parents are tired, but you know who’s not tired? Kids are super hyper and excited about Halloween. I’d like to know who decided that Halloween should be the very last day of October, because my kid’s don’t have the patients to wait an entire month for a holiday to arrive. Because my kids are so hooked on Halloween this year, I’ve come up with a Halloween STEM activity for every day of the month in October. This project is one of my favorites, because it is super simple. Best of all, it’s just as suited for the classroom as for home. 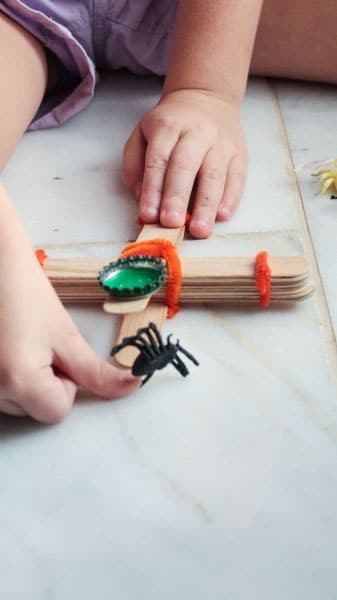 It’s a creepy crawly Halloween catapult that you can make in less than five minutes, and if your kids are anything like mine, it will keep them engaged for over an hour. 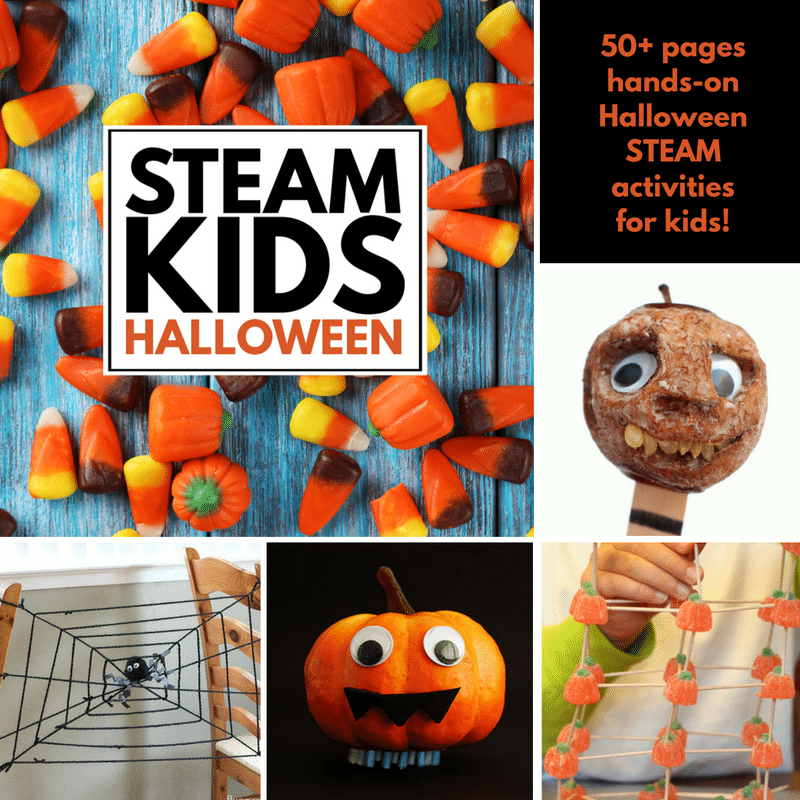 We plan to re-do this activity on Halloween night so that the kids have something to do while waiting ever-so-impatiently for trick or treating. 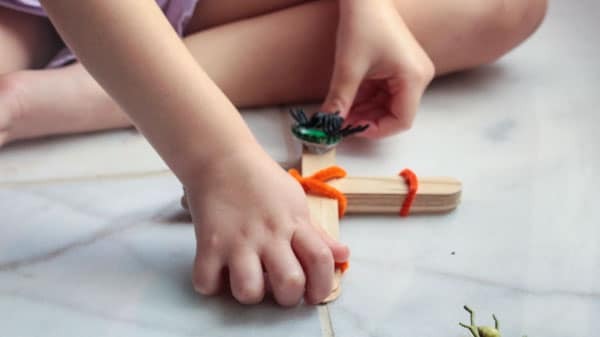 In five minutes or less, you can make this super adorable creepy crawly catapult that will keep your kids entertained for hours. Make it the day of Halloween to keep the kids busy while they wait the agonizing 3 hours after school lets out before they can go trick or treating. 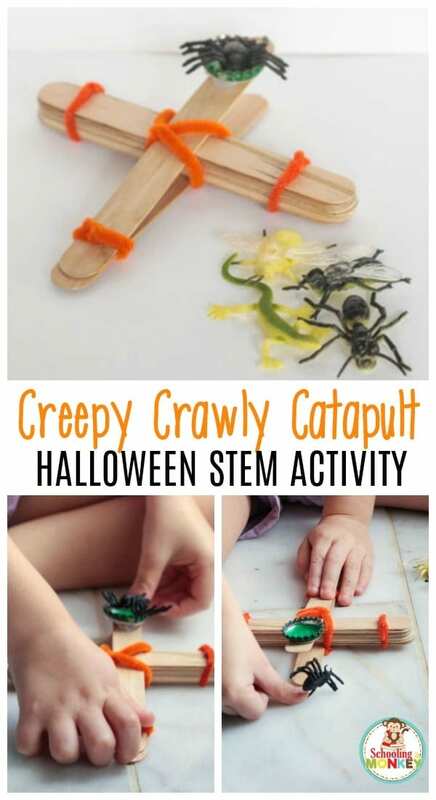 You will need 8 Popsicle sticks to make the Halloween catapult. Take two sticks and lay them on top of each other. Use a piece of pipe cleaner to tie one end together as pictured. Stack the other six sticks together and tie on both ends to hold the sticks together. Wedge the two-stick stack between the six-stick stack. 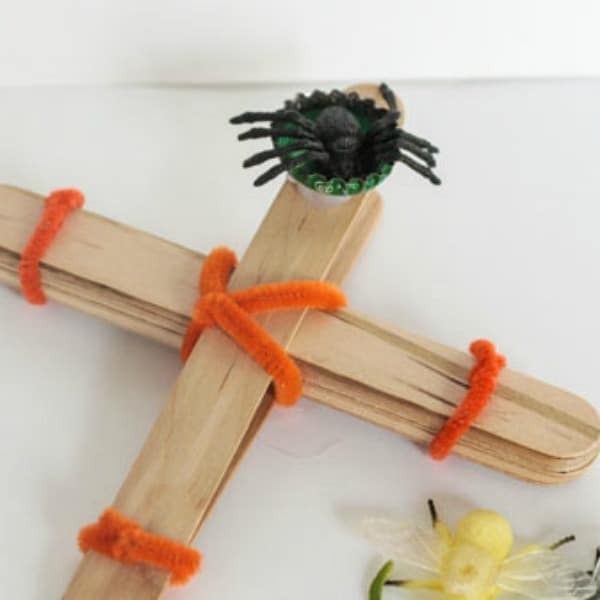 Use pipe cleaners to tie the sticks together as pictured. Glue the bottle cap to the open end of the catapult. Place a bug in the bottle cap and pull back on the stick. You will probably have to hold the front end of the stick down to stabilize it. Let your finger go, and watch your bugs fly! Make this more STEM-oriented by checking to see if the angle of the catapult affects how far the bugs will fly. Mark the landing spot of each bug with a piece of masking tape. Do the bugs fly farther if the catapult is longer or shorter?